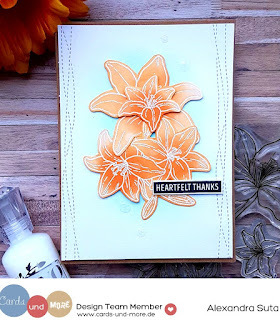 Lately I really enjoy using this color combo ( orange and teal ) and for the card today I started by stamping the leaves from Harvest Buddies stamp set from MFT using Versa Mark ink and embossing powder. Next I inked part of the background using Memento dew drop - Tangelo and Distress ink - Antique linen . Next I inked the second panel using Peacock Feathers distress ink and stamped the sentiment from Happy Hedgehogs stamp set from MFT using again Versa Mark ink . 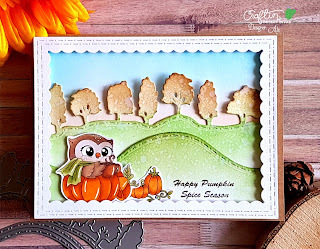 Since I already have the images coloured ( using Polychromos pencils) I stamped the sentiment on the panel using Versa Mark ink and embossed using white embossing powder. Next I die cut the Forest border from Lawn Fawn and inked the panel and the border using distress ink ( Peacock Feathers , Antique Linen and Vintage Photo ) and then added some water splatters . After the panels dried I adhered them using foam tape for the forest border and double sided tape for the front panel. For the critters I used a combination between foam tape and liquid glue and to finish up I added some Pretty Pink Posh sequins ! Also since my term in the design team is getting closer to the end this will be my last card that I make as a Design team member so I think is the perfect way to show my appreciation to the other design team members and Dunja ! Thank you ! So first I started by picking the paper and since I wanted to water color I choosed Water Art - Aquarellpapier A5 and using Versa mark ink I stamped the flowers and embossed them using white embossing powder. Next I heat set the powder using my heat tool and scribbled some Distress inks on a piece of laminate paper and started coloring my flowers. 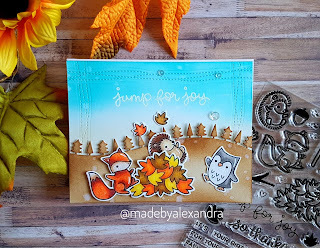 Stopping by today to share this fall card that I made using Craftin Desert Divas stamps and dies. 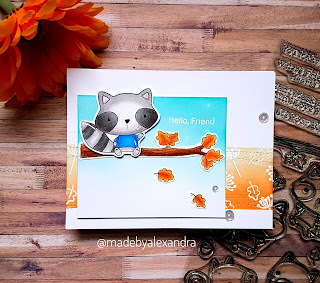 For this card I started by die cutting the panel using Fancy frame dies and the Inside scalloped circle dies Then I colored the cute critters from Timber stamp set using Spectrum Noir alcohol markers and then fussy cut everything . Also I wanted to add some more details so I die cut the clouds from Scene builder dies and adhered everything using foam tape! Because I didn't wanted to have a plain panel I stamped the leaves from the Timber stamp set using Memento dew drops grey ink. To finish the card I stamped the sentiment and also adhered some sequins! 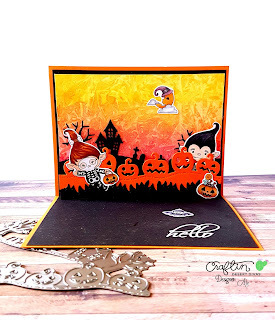 This card was inspired by the current mood board challenge from Craftin Desert Divas ! 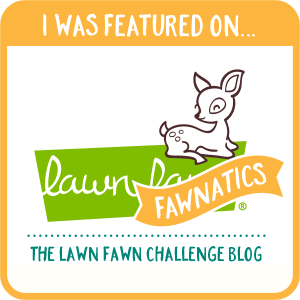 Come join us on CDD Facebook group and enter your creations for a chance to win some prizes. 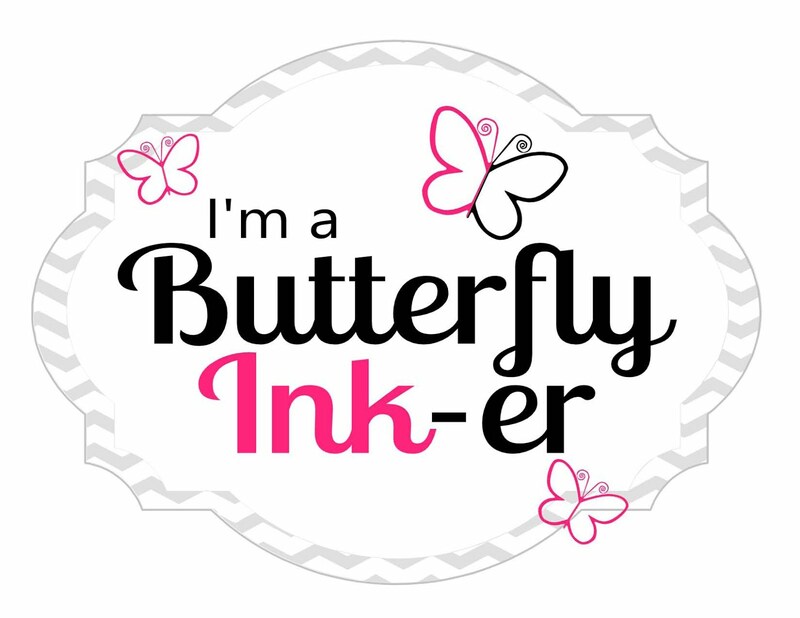 For this card I started with a new to me technique and that is : stamping the images using Versa Mark ink and embossing with white embossing powder, then ink blend the colors and fussy cut the images . A saw a lot this technique and I think the Jane's Doodles set is just perfect for this. Before adding the images on the main panel of my card I took the Peacock feathers distress ink and inked the panel in the middle using a very light hand in order to create a soft look. For this card I started by coloring this cute owl using Spectrum Noir markers and the fussy cut it ! 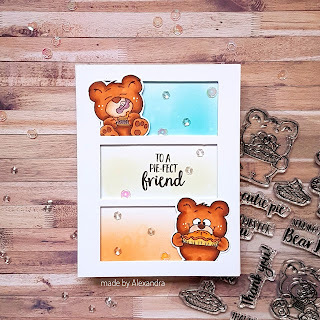 DT Ale here today sharing a pop up card that I made using stamps and dies from the new September release! 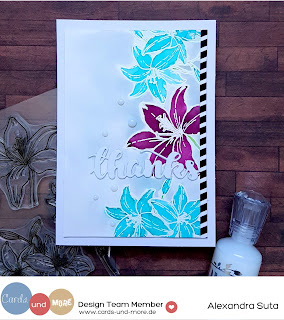 For this card I started creating a water color background and stamped the images from the Frigthfully sweet stamp set and colored them using Spectrum Noir alcohol markers. To adhered everything together I used score tape and liquid glue, and also added the sentiment Hello from Say it big stamp set using white embossing powder. For this card I started by coloring the adorable bears using Spectrum Noir Alcohol Markers and the fussy cut them. Next I worked on my background and for that I cut a piece of cardstock to match a card base and the I took a rectangle die cut and cut out the rectangles from the piece of the cardstock. Next I inked the background using Distress inks and Memento dew drops inks and stamped the sentiment in the middle on the panel. Adhered the panel to the card base using foam tape and the adhered the cute critters. As final touch I added some sequins and my card was finished ! Thank you so much for stopping by today! Have a wonderful day!